Double Initial Necklace, personalised jewellery for the one you love most. Jewellery always makes for the most ideal gift for any girl, whether that be a gift for your best friend, sister, daughter, mother, wife, girlfriend, god daughter and so on. As lovers of jewellery, girls often have a favourite necklace they wear day in day out, so why not go for a necklace that is that extra bit special. 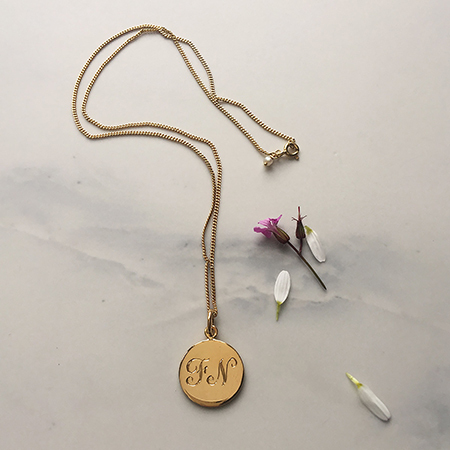 Nothing pleases us girls more than a piece with a lot of thought and meaning behind it, and our double initial necklace makes for an ideal personalised piece of jewellery to add to her collection, and become the necklace she wears all day, everyday. Double Initial Necklace is a sure way to not only make her day, but her year and more. Here are some ideas of what pretty scrolled initials you could choose to have hand engraved on the disc. Perhaps most obviously, you could get the initials of the special someone you are treating with the Double Initial Necklace own initials of her first and second name engraved, making the necklace all about her. A popular choice for personalised necklaces. Or maybe you want to celebrate the treasured relationship between the pair of you, best friends, siblings, girlfriend and boyfriend, husband and wife. The Double Initial Necklace is a great way to double up and get both yours and the person you are gifting initials of your first names hand engraved and entwined together on a single disc charm. The remedy if you are stuck on what initials to choose, while also carrying the sentiment of togetherness forever. The Double Initial Necklace is also the perfect piece of jewellery to celebrate family love. Why not get the initials of your parents, or siblings hand engraved on the disc, carry them with you always even if you live far apart, a great reminder of your family. Double Initial Necklace is also the perfect gift for a Mum. Have each of her children’s initials hand engraved on the disc so that she can carry the memento of her little one’s around her neck with her always. Create a love memento to be carried close to heart with the Double Initial Necklace. Available in all precious metals, sterling silver, 18ct Yellow or Rose Gold Vermeil, and please do contact us if you would like the necklace in Solid Gold.